What are some well-known university-run observatories? Among the best known university observatories are the Harvard-Smithsonian Center for Astrophysics; the University of California’s Lick Observatory; the California Institute of Technology’s Palomar Observatory, and Keck Telescopes (in collaboration with the University of California); the telescopes on Mauna Kea, Hawaii, and Mees Solar Observatory on Maui, operated in part by the University of Hawaii; and the University of Arizona’s Steward Observatory, Arizona Radio Observatory, and Mount Graham International Observatory. 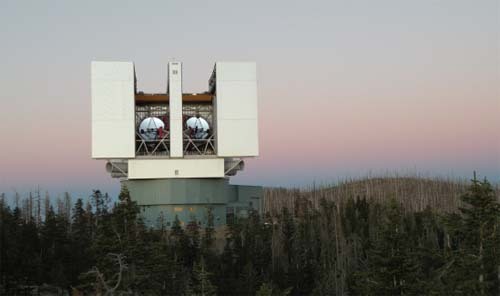 One of the world’s most advanced telescopes, the Large Binocular Telescope on Mt. Graham, about 100 miles east ofTucson, Arizona, has two 8.4-meter mirrors.